Up to 25% of adults suffer from temporomandibular joint disorders (TMJD) at some point in their lives. The condition affects people in a variety of ways from complaints of radiating pain in the face, jaw or neck; headaches or migraines; tooth grinding; jaw muscle stiffness; aching pain in and around the ears; difficulty or discomfort while chewing; limited movement or locking jaw; or painful clicking in the jaw joint when opening or closing the mouth. The Cerezen™ device is an entirely new and clinically proven treatment which has recently become available for treating TMJD, which literally approaches the condition from a new direction. 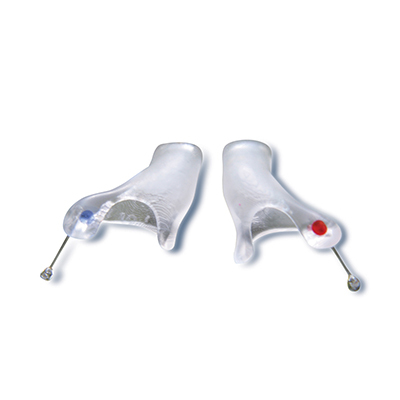 The medical device is an inconspicuous set of custom-fit removable ear inserts worn within the ear canal – a complete contrast with the bite splint. Two mechanisms are believed to be responsible for the clinically proven effectiveness of the Cerezen™ device; the ear inserts support the temporomandibular joint (TMJ) and associated secondary musculature to reduce strain and they also provide ‘cognitive awareness’ (consciously or subconsciously) to the wearer regarding para-functional habits (e.g., jaw clenching) which contribute to TMJD pain, relieving strain in the area. Both mechanisms function because of the proximity of the ear canal to the TMJ, and because the ear inserts maintain the shape and volume of the ear canal as the jaw opens and closes. The custom-made device is hollow to permit the passage of sound. The discreet device is imperceptible and is worn in the ear canals day and / or night as required (and only needs to be removed for contact sports, swimming or showering). The tailor made devices are delivered to the dental practice for fitting within two weeks of prescription. Cerezen™ ear devices qualify for 20% tax relief through the Med Form 13. Call us today at 066 712 1457 to discuss further.